As part of the Mickey’s Halloween Party that Disney World celebrates each year during Halloween at the Magic Kingdom, a Disney Villains show featuring some of Disney’s most popular characters that visitors love to hate, is shown four times a night followed by a special villain meet and greet in front of Cinderella Castle. The show, just coming in under 9 minutes, starts off with Dr. Facilier of the Princess and the Frog doing a dance number as the master of ceremonies. It’s a little bit of rock and roll that is reminiscent of something you might see at the old Pleasure Island West End Stage, but with a Halloween theme. Dr. Facilier then does his big single from the movie Are You Ready with a little bit of Voodoo and Tarot Cards on stage with ghost puppets flying overhead. 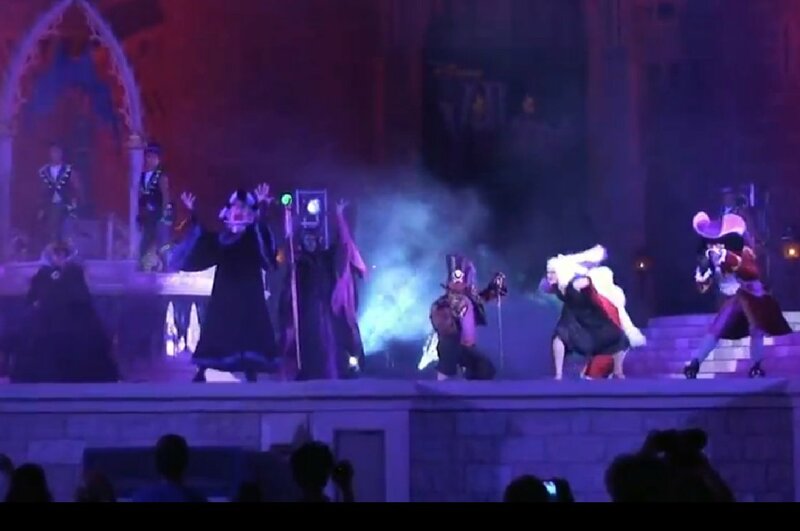 The next act brings all of Disney’s biggest villians on stage at the same time with the Evil Queen from Snow White, the Queen of Hearts, Malificent, Captain Hook, Cruella Deville, and Judge Claude Frollo from the Hunchback of Notre Dame. Immediately after the villains are all on stage, you can get some good pictures with each villain doing their signature moves. After the musical number is over, the villains go to the forefront of the stage in front of Cinderella Castle to mingle with park guests. Click Here to read our full coverage of Mickey’s Halloween Party on Orlando Local Guide. Click here to read about all of the events going on around Orlando for Halloween. This entry was posted in Attractions and tagged annual events, disney world, halloween, holidays, october, september. Bookmark the permalink.